The evolution of the human brain and cognitive ability is one of the central themes of physical/biological anthropology. Based on studies of the modern human brain, certain prerequisites were needed for the development of the early brain and associated cognitive advances. Important prerequisites included polyunsaturated fatty acids and other brain selective nutrients, which are found in highest quantity in fish and shellfish. Early hominins were able to access these foods when frequenting wetlands, particularly lake and river margins. Increased consumption of this high–quality diet over time exaptively diverted energy to the brain, and was a catalyst for brain growth. The later exploitation of marine shellfish and fish is roughly correlated with the emergence of Homo sapiens, and cognitive advance associated with changing human behaviors. Human Brain Evolution: The Influence of Freshwater and Marine Food Resources documents the energy and nutrient constraints of the modern brain, highlighting the significant role of brain selective nutrients in brain development and the evolution of neural systems. There is a particular focus on two long–chain polyunsaturated fatty acids (LC–PUFA) in brain development and maintenance docosahexaenoic acid (DHA) and arachidonic acid (AA). These nutrients are found in the highest quantity in fish and shellfish, and this volume further discusses fossil, morphological, and isotopic evidence for hominin consumption of these foods over time. The contributors to this volume come from several fields paleoanthropology, nutrition, neurochemistry, archaeology, and paleobiology providing a multidisciplinary approach to the complex and challenging topic of the evolution of the brain. The first half of this volume focuses specifically on the biochemical and nutritional requirements of encephalization of the human brain, best acquired opportunistically (exaptively) through consumption of fish and/or shellfish. The second half provides multidisciplinary evidence on the exploitation of initially, freshwater and later, marine fish and shellfish, by successive hominin taxa. 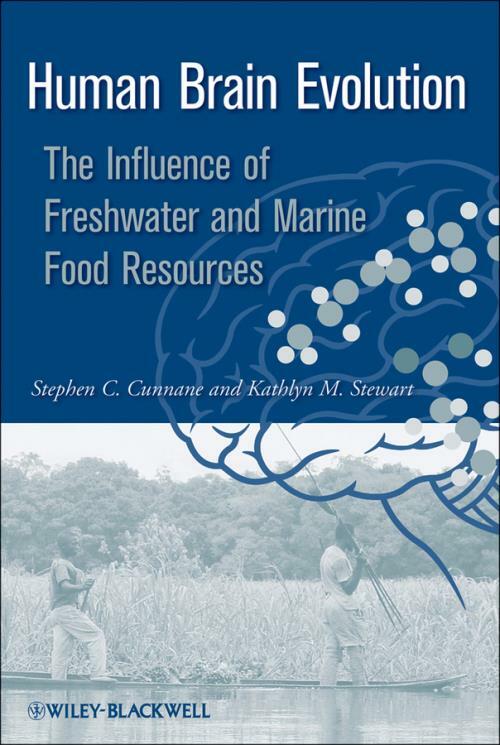 These persuasive, thought–provoking discussions and arguments provide the basis for a new perspective and help the reader understand the vital role freshwater and marine foods have in human brain function and, hence, evolution. FOREWORD: EVOLUTION, ENCEPHALIZATION, ENVIRONMENT (Phillip V. Tobias). INTRODUCTION (Kathlyn M. Stewart and Stephen C. Cunnane). CHAPTER 1: MACROEVOLUTIONARY PATTERNS, EXAPTATION, AND EMERGENCE IN THE EVOLUTION OF THE HUMAN BRAIN AND COGNITION (Ian Tattersall). Large Brains and Aquatic Resources. CHAPTER 2: LONG–CHAIN POLYUNSATURATED FATTY ACIDS IN HUMAN BRAIN EVOLUTION (Michael A. Crawford). The Evolution of Complex Life Forms. The Third Phase of Earth′s Life History AA and Reproduction in Mammals. Darwin and the Conditions of Existence. CHAPTER 3: HUMAN BRAIN EVOLUTION: A QUESTION OF SOLVING KEY NUTRITIONAL AND METABOLIC CONSTRAINTS ON MAMMALIAN BRAIN DEVELOPMENT (Stephen C. Cunnane). Energy Requirements of the Brain. Critical Importance of Baby Fat in Humans. CHAPTER 4: METABOLIC AND MOLECULAR ASPECTS OF THE CRITICAL ROLE OF DOCOSAHEXAENOIC ACID IN HUMAN BRAIN FUNCTION (J. Thomas Brenna). Docosahexaenoic Acid (DHA) Molecular Structure. Functional Importance of DHA in Retinal and Neural Membranes. Dietary Need for Preformed DHA. DHA Intake During Pregnancy and Lactation: Effects on Higher CNS Functions of the Mother and Infant. CHAPTER 5: LESSONS FROM SHOREBASED HUNTER–GATHERER DIETS IN EAST AFRICA (Frits A.J. Muskiet and Remko S. Kuipers). Adaptation to the Conditions of Existence. Western Diets and the Human Genome. Brain–Selective Nutrients in Health and Disease. Dietary Fatty Acids at the Land Water Interface. Tanzanian Breast Milk Fatty Acids Versus Western Recommendations. Estimated Fatty Acid Intakes from Shore–Based Paleolithic Diets. CHAPTER 6: THYROID HORMONE, IODINE AND HUMAN BRAIN EVOLUTION (Sebastiano Venturi and Michel E. Bégin). Thyroid Hormone Metabolism and Function. Thyroid Hormone, Iodine, and Human Brain Evolution. CHAPTER 7: FOOD FOR THOUGHT: THE ROLE OF COASTLINES AND AQUATIC RESOURCES IN HUMAN EVOLUTION (Jon M. Erlandson). Archaeological Evidence for the Antiquity of Fishing. CHAPTER 8: THE CASE FOR EXPLOITATION OF WETLANDS ENVIRONMENTS AND FOODS BY PRE–SAPIENS HOMININS (Kathlyn M. Stewart). Hominid Exploitation of Wetlands Environments and Resources. Early Hominins: Colonization of New Environments. Plio–Pleistocene Climate Instability and Use of Wetlands Resources. Intensifi cation of Wetlands Vegetation Exploitation. The Shift to High–Quality Foods. Precessional Forcing, Drying Lakes/Rivers, and Die–Offs of Aquatic Faunas. Mammal Meat: A Later Hominin Adaptation? Postscript: H. heidelbergensis and H. sapiens. CHAPTER 9: BRAIN SIZE IN CARNIVORAN MAMMALS THAT FORAGE AT THE LAND WATER ECOTONE, WITH IMPLICATIONS FOR ROBUST AUSTRALOPITHECINE PALEOBIOLOGY (Alan B. Shabel). CHAPTER 10: COASTAL DIET, ENCEPHALIZATION, AND INNOVATIVE BEHAVIORS IN THE LATE MIDDLE STONE AGE OF SOUTHERN AFRICA (John Parkington). CHAPTER 11: HUMAN BRAIN EVOLUTION: A NEW WETLANDS SCENARIO (Stephen C. Cunnane and Kathlyn M. Stewart).